After the proliferation of commercial DNA testing, the top companies in the field also started focusing on animal DNA solutions, especially those developed for man’s best friend. Including the top-ranked DNA testing companies on the market, our guide to the best dog DNA tests of 2019 will equip you with the necessary knowledge to make a completely informed choice that can meet all your needs – and the needs of your furry friend. Wisdom Panel, a division of Mars Incorporated, has ample resources to provide top-quality animal DNA testing. 800k tests done and 12k DNA samples collected can attest to the quality of its testing solutions. Embark is a successful startup launched in 2015. Despite its youth, the company is a remarkable amalgamation of high-quality canine DNA testing options, expertise in the field, and highly-skilled staff. EasyDNA offers a broad spectrum of canine DNA tests, which can be used by any veterinarian, breeder or owner who wants to know all about their dog's health, parentage, and genetic heritage. With an e-commerce approach to DNA testing, Live Well Testing offers the quickest home/lab canine DNA tests, alongside health-monitoring equipment for your dog. DDC Veterinary is the animal-centric division of DDC focused on providing a multitude of animal DNA tests. It comes equipped with the same level of expertise and service quality like DDC, just aimed at animals. One of the crucial factors we focus on at the very beginning of our ranking process is that of test variety and quality. Of equal importance are test accuracy and the likelihood of test error and failure. More specific test-related criteria include the number of checked DNA markers and the quantum of checked breeds, genetic diseases, and potential physical traits. The quality of test results is further determined by the professionalism of the staff and the quality of the testing facility and equipment. After carefully analyzing all test-related factors, we proceed to thoroughly inspect different aspects of customer service. These include the quality of customer support, turnaround times, privacy and information security, and of course, prices. Finally, we take into consideration the available partnerships with relevant entities, including veterinarians and animal clinics. Now that you know how our ranking process works, let’s take a closer look at the best dog DNA tests on the market! Founded in 2005, Wisdom Panel is the sub-operative of Mars Petcare, a division of Mars Incorporated. The company specializes in DNA tests for canines, but it is constantly expanding its program, so we’re sure we can expect more solutions in the future. Wisdom Panel has performed over 800,000 tests so far, has over 12,000 samples in its database, and covers 99% of the 180 breeds recognized by the AKC. It also has multiple partnerships in the field, including Washington State University, Genoscoper Laboratories Finland, Geneseek, Waltham, Morris Animal Foundation, Orthopedic Foundation for Animals, and others. The price tag for this test is 84.99$, with a turnaround time of 2-3 weeks. It can be performed on purebred, mixed breed, and designer dogs. The results provide purebred ancestry identification (3 generations), weight profile prediction, info on physical traits, MDR1 genetic mutations, and the possibility of Exercise-Induced Collapse. You’ll also receive a predicted weight profile, a genetic trait analysis, and a unique discount code for your family and friends. You can also share the results with your veterinarian. This test combines screening for potential genetic health conditions with exhaustive breed detection. The test costs $149.99 and has a turnaround time of 3-4 weeks. The results provide a full genetic disease report (among 150 conditions), reports on morphology, coat properties, and other traits, a personal dog profile you can share, a breeder tool for identifying compatible mates, and constant updates to the results. Wisdom Panel 2.0 and 3.0 can now only be purchased through online retailers. Embark is a successful startup put in motion by brothers Adam and Ryan Boyko, two prominent scientists and genetics aficionados. It’s the youngest company on our list by far, being founded in 2015. Embark features a detailed canine DNA test with over 256 quadrillion genetic combinations tested. The company processes the samples in a modern lab and allows for raw data download. Embark has partnered with the Cornell University of Veterinary Medicine and the ever-present Scientific Advisory Board. On top of that, it engages in numerous research projects and does charity work whenever given the opportunity. The Embark Dog DNA test costs 199$ (shipped internationally) and offers breed identification + ancestry research for your dog(s) by cross-referencing its DNA with more than 250 dog breeds, including village dog. Additionally, you’ll also receive a health report that screens for 165 common genetic canine diseases. The test checks more than 200,000 genetic markers. Your final report will also determine the genetic age of your dog, allowing you to “translate” it into human years. The last part of the report will indicate detailed care and wellness recommendations based on your dog’s genetic age. 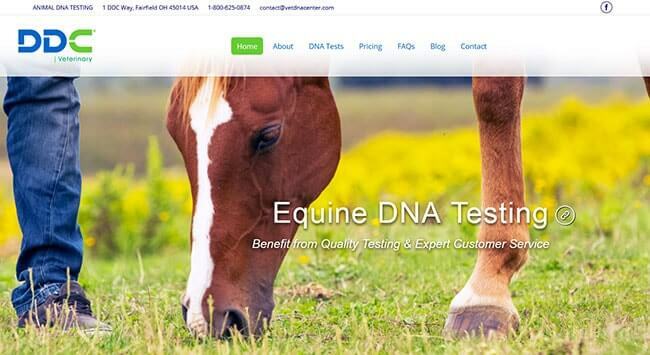 Embark also offers a DNA test specifically designed for breeders. For the price of 179$ (special discounts for bulk purchases), you can learn how to breed your litter for a specific size and coat color/texture. There is also a special offer for veterinarians who choose to sell Embark tests in their clinics. EasyDNA has more than 35 offices in different regions of the world, which makes its canine DNA tests the most accessible ones on the market. It currently boasts more than 300,000 tests executed, complementing high-quality service with knowledgeable user support. EasyDNA offers 6 different canine tests, which check 21 DNA markers, ensuring 99.9999% precision. Canine parentage testing without the mother’s sample is much more complex and difficult, but EasyDNA offers this possibility nonetheless. The price is 306$ and the average turnaround time is 10 business days. This test allows you to identify the genetic combination of your mixed breed dog. The price is 79$ and the results are usually complete within 2-3 weeks. Note that the entire dog’s genome is tested, so the results might not reflect its current appearance. This test establishes your dog’s parentage in a definitive manner. The price is 198$ and the results are ready in 10 business days. EasyDNA tests your dog for diseases and traits specific to its breed. The price is 75$ and the results are complete within 7 business days. The price of this option is 99$ and it is designed to detect the most common allergens that affect your pet in negative ways. The results are usually ready within 2 weeks. The company’s only price-on-request product is more aimed at identifying irresponsible owners than anything else. As such, it is not of interest to our current topic. Live Well Testing is an e-commerce branch of Confirm BioSciences, stationed in San Diego. It offers a plethora of canine DNA testing solutions and many dog wellness kits and equipment. Dog Genetic DNA Disease & Trait Test – For the price of 129.99$, your dog is checked for over 150 dog traits and diseases. The results are ready within 7-10 days. The test examines the overall health of your pet. The price is 10.99$ and the results are available instantly. It screens for infections of the urinary tract, kidney failure, and diabetes. The price of the test is 29.99$ and the results are complete within 2 minutes. This test discovers pathogenic strains of canine Coronavirus and Parvovirus. It costs 19.99$. It discovers hookworms, roundworms, whipworms, and coccidia. The price is 33.99$ and the results are available 24 hours upon sample receipt. Live Well Testing also provides tests for heartworms, Ehrlichia, and Lyme, as well as kits and strips for glucose level monitoring. It ships its merchandise worldwide, so you can order any test from pretty much any part of the globe. On top of frequent discounts and coupons, Live Well Testing also holds a price match policy, which means it’ll match any lower price for the same products as the ones in its offer. DDC Veterinary is a division of DDC, one of the largest private laboratories for DNA testing. The father conglomerate was founded in 1995 in Fairfield, Ohio, which gave it ample time to hone its service quality and staff professionalism. DDC is the first (and only) laboratory to implement robotics technology into its testing processes. DDC features a multitude of international partnerships and accreditations (AABB, ANAB ISO/IEC 17025, ASCLD/LAB -International, College of American Pathologists, New York State Department of Health, and others). Every test is executed twice and overseen and reviewed by a Ph.D.
DDC Veterinary offers a wide assortment of animal DNA tests, including canine, feline, avian, equine, and alpaca testing solutions (DDC is the official DNA testing provider for the Association of Alpaca Owners, located in Lincoln, Nebraska). This test replaced Wisdom Panel 3.0 in DDC Veterinary’s portfolio and costs 89$ + shipping. The test screens for 220+ dog breeds (wolf and coyote included) and the final report is generated within 3 weeks. The price of the test is 38$ per sample plus shipping and it determines and certifies the parentage of the litter. Personalized profiling of the dog costs 38$ per sample plus shipping. It checks 16 genetic markers in the dog’s genome. Your dog is tested for the genetic presence of 10 different inherited diseases. The price is 58$ plus shipping. With this test, the test subject is tested for 7 inherited traits. The price tag is 58$ plus shipping. This guide to the best dog DNA tests of 2019 presented a healthy mix of companies dedicated to animal testing. Our demanding criteria were met by all of the providers on the list and they are only separated by nuances in service quality and other areas. Depending on your specific needs, every company can be a perfect choice in some instances. For example, if you’re worried about international shipping and available support, EasyDNA will meet your every requirement with its 35+ offices scattered across the globe. If you’re also interested in avian or equine DNA testing, DDC Veterinary offers those possibilities. If, however, you want a 100% canine-focused company, Embark and Wisdom Panel are the way to go. Live Well Testing is the supreme choice for anybody who hasn’t really made up their mind yet and wants to see all of the options gathered in one place. It’s also a “hybrid” company where you can order tests for yourself and your pets in a single swoop. Our research team provided you with a suitable option for every opportunity, you just need to identify your specific needs and look for the best company to meet them. For detailed information on separate companies, you can always go to our dedicated reviews of the best dog DNA testing companies.